More than just a bit biased sometimes! 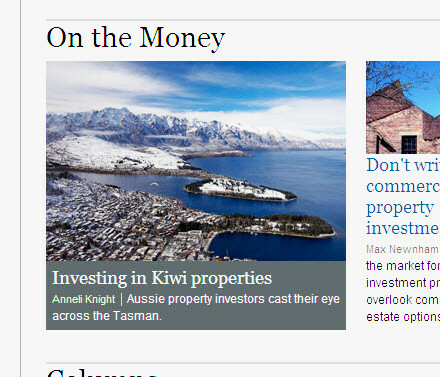 An article appeared online 5th Oct 2010 entitled “Now’s the time to inspect Kiwi properties” written by Anneli Knight, which has subsequently been syndicated this side of the Tasman by stuff.co.nz. As well as Queenstown, O’Brien says areas of New Zealand that have been popular with Australian buyers this year have been Nelson and Marlborough (both in the top part of the South Island with vineyards and coastal attractions) and Tauranga, in the North Island’s Bay of Plenty area. The article published by stuff.co.nz was just about quoted in whole, except for the reference sites mentioned at the bottom of the Australian based article. These are headlined in bold as Useful web resources. 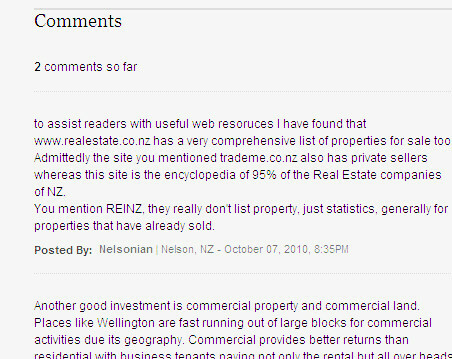 How, in October 2010 can they quote www.reinz.co.nz as a useful source of property for sale? 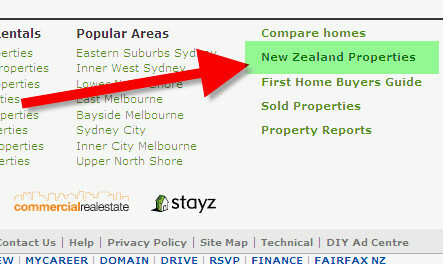 They go on to mention www.trademe.co.nz but fail to mention NZ’s biggest realestate only site www.realestate.co.nz. Yes I know its a business these days, directing of browsers to your own web site but try to be at least a bit objective folks. To their credit they did publish my above comment though this morning. This entry was posted in Buyers, Nelson, New Zealand and tagged Buyers, buying, education, ex-pats, Nelson, NZ, OIO on October 8, 2010 by David Leggott. “In recent months, ministers have carefully reviewed the current framework for considering overseas investment applications – particularly in light of issues with respect to farmland ownership,” Mr English says. Plenty of column centimetres has been spent over recent months documenting overseas investment in NZ farmland, and I’m sure this has had some effect. The Government last year made several changes to simplify overseas investment rules, cut red tape and speed up processing times for applications. and highlights that over the past 12 months, applications processing time-frames have been reduced from 63 days down to an average of 38 days. As an aside, the press release states……. These changes are expected to take effect from December. They will apply to applications received after this date and will not apply retrospectively. 6. What do the changes mean for overseas investment applications already submitted? Applications already submitted will be assessed under the current regulations. The new regulations will be applied to those investment applications that are made after the new regulations come into force. Surely this will be in print media Thursday and syndicated around the world at the same time….so it makes sense if you have overseas buyers that like real estate in popular Nelson, or other popular areas around NZ like Tauranga, Hawkes Bay, Northland, the Coromandel and Queenstown for example, that you are armed with the info when you get that call or email over the next few days……because rest assured the “media” will probably not paint it in a positive light. This entry was posted in Buyers, New Zealand and tagged Buyers, buying, coastline, immigration, NZ, OIO on September 28, 2010 by David Leggott. 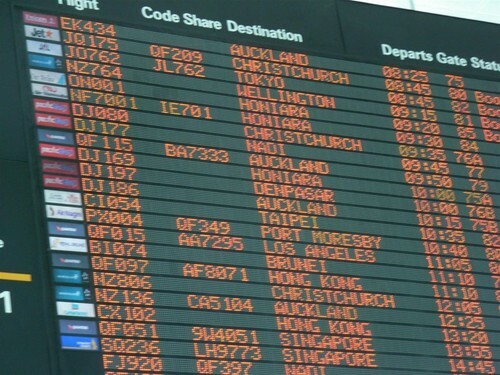 On Tuesday this week Government Ministers Gerry Brownlee and Jonathan Coleman released a statement to the press regarding a revamp of certain previous requirements regarding entry, and consequent residential status in NZ. Amid much publicity surrounding the new “have to be rich” criteria pertaining to business/investor migrants gaining NZ residency, there was a slightly smaller mention in the media of a new “PLUS” class under the entrepreneur category of business migrant. In fact overall they are reducing the present 3 categories down to 2. The lowering of the investment minimum, from $20m down to $10m and a reduction of 1 level of ILETS from 4 down to 3 (with supporting conditions mind you) got most of the hype in this Business Migrant Scheme Revamp, but overall I think this new Entrepreneur Plus classification could actually have an effect from a property sales perspective, especially “lifestyle” properties. Just to save any confusion here, the requirements I am talking about above is different than the “Skilled Migrant” category requirements – more details about Long Term Skill Shortage List (LTSSL) and the Immediate Skill Shortage List (ISSL) categories over here. GRAPHIC DATA taken from Appendix to the Beehive Press Release here. This entry was posted in Buyers, General, Nelson, New Zealand, retirement and tagged immigration, OIA, OIO on July 29, 2009 by David Leggott. Seniors – are you ready for the High Life? Want to be near the beach, it has its advantages and disadvantages. As regular readers here are well aware, we are a region that has not been blessed with unlimited geographic bounds. Spatially wise that is really our only issue because we win “hands down” just about any other one. Ok….long story short…….the Gold Coast of Oz attracts more than its fair share of boomer retiree’s (think South Beach for our cousins a bit north latitudinally inclined.) In fact I think its about 16k overall new residents each calendar year from memory, and the last time Iooked at the data, a third were retirees. And so…..the rise and rise of retirement villages, many planned, concepted or already constructed…boomers rejoice! Down on the southern part of the Gold Coast comes this new (well to QLD at least) concept. Instead of the perfectly laid out, single story, proximity perfect retirement (over 55’s) location habitats, these folk thought vertical. Courtesy of goldcoast.com.au comes this developers point of view…. Michael Matusik, of Matusik Property Insights, told a conference the Gold Coast was poised to follow the US with ‘vertical’ retirement villages now all the rage as retirees seek security, views and resort-style living in a CBD near medical centres and shopping. What say you had a whole lot of people (with no dependents) who actually liked the idea of living independently “right on the beach.” Would they pay for it? Well $14million in sales in a couple of weeks would tend to indicate they got their thoughts right. The bottom stories accommodate car-parking, and other services related to “aged care”, then the apartments are above that. And you know what, although I am struggling to pull it up on Bing or Google, Takapuna are about to try it soon…….well certainly in a proposed sort of way. This entry was posted in Buyers, General, New Zealand, retirement and tagged OIO, retire on July 24, 2009 by David Leggott. NZ Properties – any changes for non-resident purchasers? NZ Properties – now easier to buy for non-residents? Maybe, maybe not. They’ve hit the news again recently with the government announcing yesterday that for most overseas investment applications the process has been further streamlined and many will no longer need ministerial approval. TVNZ report 24th July 2009…. Under the changes, ministers have delegated greater decision-making powers to the Overseas Investment Office, which will be able to decide all applications, other than rural sensitive land or land adjoining waterways. The changes take effect immediately. Finance Minister Bill English said 98% of all applications were approved anyway and the move would speed up the process and cut red tape. Improving the Overseas Investment Act has been on the cards for a time now. Well it does appear that for the share market and other financial investments, this might be the case, but in the case of Real Estate, maybe not. And this, I feel, is a good thing. In June 09 LINZ updated the OIO section to a new, better, improved version, with a “more user friendly” style. Amongst other changes, two new and important features to the site are the FAQ section where many questions will be answered without further searching. And the second new feature allows a browser to search past decision summaries. Of particular interest to potential NZ Real Estate purchasers in the FAQ is the section here titled More about sensitive land. An article in the NZ Herald today cites the coming need to attract investment becoming more urgent as unemployment levels grew, Minister Bill English said…. the Government would continue to protect things New Zealanders had legitimate concerns about, such as land and large businesses. Overseas investors would be subject to higher conditions, especially around stewardship and public access rights. However the Herald notes that the proposed changes would also narrow the range of land considered “sensitive” and trim down the 27 criteria for buying such land. For the current regulation guidelines, you can find out about timeframes, if consent is required, charges, what exactly is Sensitive land, helpful flowcharts, etc over at the site. So if you want to join Eileen Lange**, but have not yet got your NZ residency granted, then like her this is the process you need to go through. 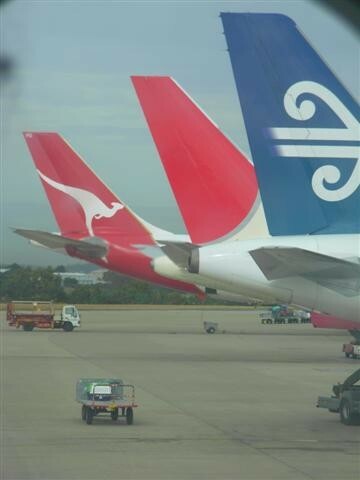 This entry was posted in Buyers, General, New Zealand and tagged immigration, OIO on July 24, 2009 by David Leggott.